Kickstarter Campaign for a cute package that is delivered to Bookzle subscribers every month, which includes three age appropriate selections along with developmentally focused tools and guides. We are passionate about helping parents do the very best for their kids and we believe we can make a real difference with the new children's book subscription. Founders of Bookzle and parents to two boys, Brandon and Natalie Shaw have discovered the major importance of reading aloud to children daily and they have developed a monthly children's book subscription that will help parents foster developmental improvement and literacy in their own children. 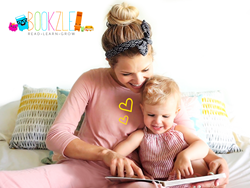 Bookzle is not merely a “book club” for children; it is the first of its kind to combine a monthly book subscription with support for parents and developmental progress tracking. A Kickstarter campaign was launched on July 1, 2016, in order to raise funds and enable the organization to purchase materials in large quantities, thus making the subscription service more affordable for all. The campaign already gained a few supporters and reached 10% of its goal in its first day. “We are passionate about helping parents do the very best for their kids and we believe we can make a real difference with the new children's book subscription,” said Brandon Shaw, Founder of Bookzle. Bookzle was formed after the Shaw's learned news about their second-born child's rare genetic disorder, which affects his hearing and requires him to use hearing aids. Attempting to keep their son on track developmentally, the couple incorporated daily reading into their routine. Seeing much improvement, they researched the importance of reading aloud to children. Some studies have shown that being read to daily can put a child almost a full year ahead of other children who are not being read to. There are thousands and thousands of children's books available in book stores and libraries. It may be overwhelming for parents to choose ones that are written for their child's developmental level and that catch the interest of the child. Bookzle's founding team brought on an expert in the field of early childhood education, Lori Ruth, who has a master's degree in early childhood special education and over 20 years of experience. The team takes great care in selecting specific books for each child, which are targeted at the child's specific age, down to the month. The book selection delivered to the subscribers can be cherished for years to come. Children can return back to their favorite old stories over and over again, directly from their own library, made possible by Bookzle. Each month, a cute Bookzle box is delivered to a child with a subscription. It includes three carefully selected books, a parent guide, a reading chart and a goal prize. The guides are outlined by the company's specialist and are prepared for each child's specific age. It allows parents to track developmental goals, evaluate growth and set new goals—the end product is a tool that helps lead parents and children on the path to school readiness. The reading chart offers children a fun way to see their progress and it builds their confidence. Included in the package is a wrapped reward—the goal prize—which can be opened by the child after he or she reaches a reading goal. This excites the participant while providing another tool for developmental growth. Supporters of the Kickstarter campaign, Bookzle: Daily Reading and Early Childhood Development, enjoy a discount on the book subscriptions. A one-month trial is awarded to supporters who pledge $34 or more, and longer subscriptions are given to higher supporters—6 months, 12 months, 2 years or 4 years. Visit https://www.kickstarter.com/projects/bookzle/bookzle-daily-reading-and-early-childhood-developm to back the project. Bookzle was founded by a husband and wife team, Natalie and Brandon Shaw. A loving mother of two, Natalie is the creative mastermind of the organization, while Brandon brings his entrepreneurial and leadership skills to the table. For many years, Brandon worked as a senior developer and director of development. Now, the couple has created a resource for parents to use for preschool and kindergarten aged children. The organization plans to donate to organizations and non-profits that promote literacy and early childhood development in children throughout the world. Read more about the company at http://www.bookzle.com.